This delicious and easy (and cheap) frozen dessert is inspired by my favorite lunch. Anyone who has worked with me knows that i eat a peanut butter banana sandwich just about every week. First, cut up 5-6 bananas into a plastic bag, or some other container you can put in the freezer. We get our bananas from Trader Joe’s, and because they are sold at a per banana price, our bananas are pretty huge. So, our 5 bananas might be the equivalent of 8 normal size ones. Freeze the bananas solid. I don’t know why they look so hideous in this photo – they aren’t as repulsive in person. I just cut them up before work in the morning to make the ice cream when I return home. This blender requires that I continually prod the frozen bananas down to the blades until it is finally all smooth. Also, it makes some worrisome whirring sounds when it finally does catch a banana hunk. 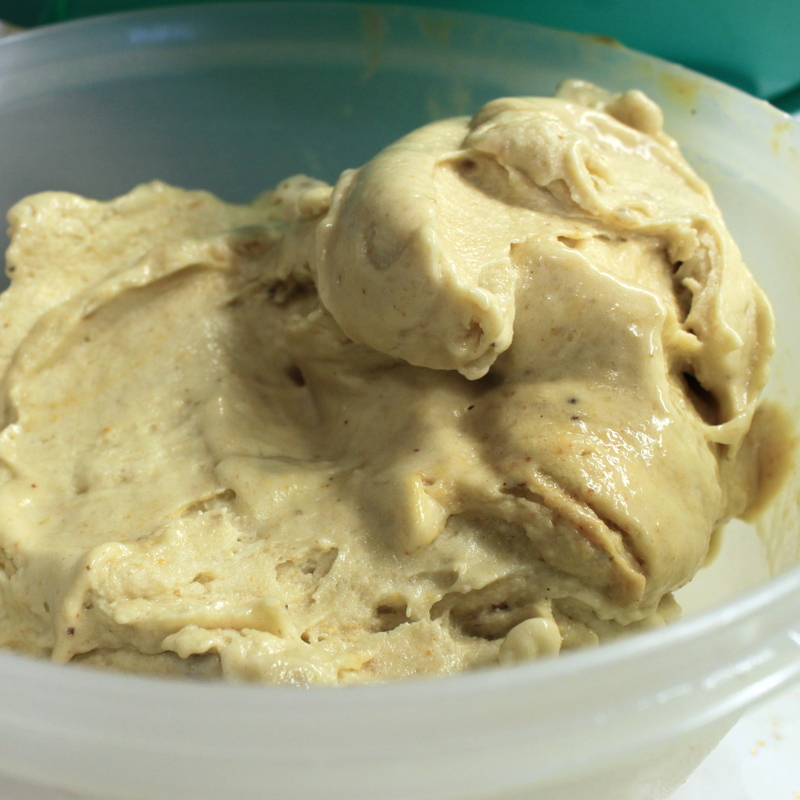 Just last week (100601) I made another batch of ‘ice cream’ (this time using cocoa instead of peanut butter). I tried using a food processor instead of the blender and it was much better! I guess our blender is prettymuch reserved for margaritas now. 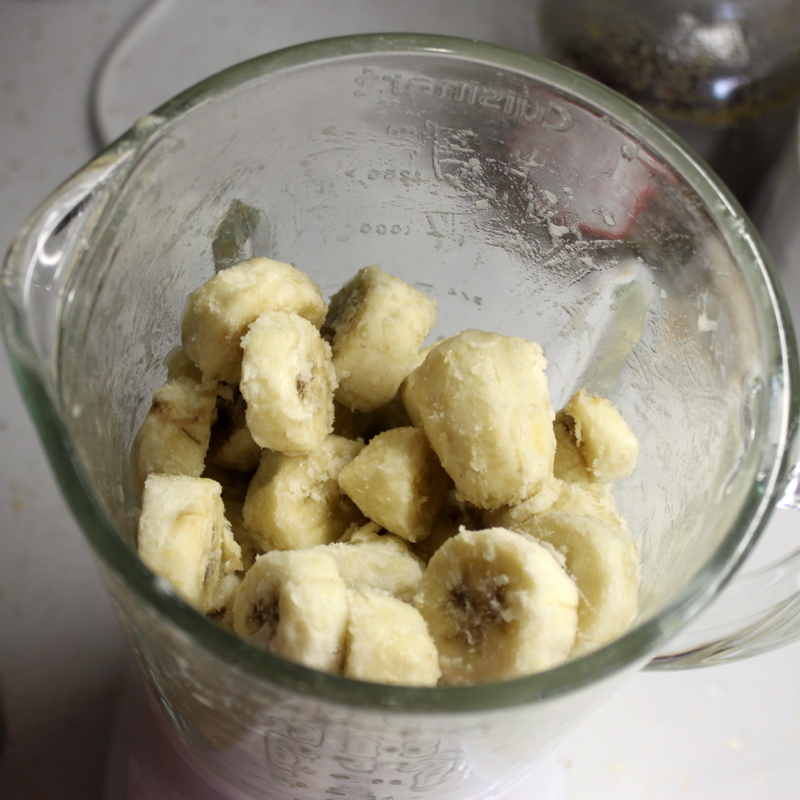 After about 3 minutes of blending/ processing, the bananas should take on a creamy texture. You can eat it now as soft serve, or let it freeze longer for a regular ice cream consistency.